One year ago I released my pattern for the Puff Quilt. And I’m so excited that I’ve sold nearly 700 copies since then! I know there are plenty of quilt designers coming out with new patterns every month, but I am definitely NOT one of them. So releasing a new pattern for sale is a big deal to me. This delightful quilt is the ultra-simple version of the Original Puff Quilt. You still sew it by machine but it’s loads easier with a more shabby chic finish. This particular quilt was sewed with the yummy Indian Summer fabric by Riley Blake. I sewed this without a walking foot and the only supplies is fabric and poly-fill. There is no backing, borders, or binding. You could make this in probably about six to eight hours, whereas the Original takes about 15. One side is ragged, and the other is finished. I sized this quilt to fit the top of a baby mattress, minus about ten inches in length (42×27). Perfect for a toddler to snuggle under on a cold winter night or sleep on top of in the summer. (And yes there is a SIDS warning in the pattern!) There are also directions to help you figure out how to make larger sizes, from twin to king. To celebrate my new pattern (and for reaching 2,000 fans on FB), I’m having a giveaway to y’all! I will giveaway 20 patterns, just leave a comment about it! I’m also offering a special discount code which you can find by visiting my Facebook Page. Just read the latest post and you’ll see it. And BONUS: this discount applies to all the patterns in my Big Cartel Shop! I absolutely love this look…I think it would be great on my queen size bed….love it .. This looks wonderful! Been looking for something for my son’s nursery! I loved your puff quilt pattern !!! My little girl never sleeps without it and Isure will love to try this new version !!! I LOVE the shabby puff. I hope I win. I’ve always loved seeing all your puff quilts. Would love to have the pattern to make my grandaughter one. Thanks for the chance. Way cute, I’m still trying to find someone to make the original one for, but I’d love to try this one for my friend’s little one, she loves the shabby chic look! I saw these on Pinterest recently and thought to myself….I need to have one of these for me !!! So I found your page on Facebook and then have been checking your website ever since….love everything you do and I would love to have a pattern and give these a try ! Fabulous quilt! I love the design and the cute fabric! thanks for the giveaway! I loved your puff quilt! I think this is my favourite quilt so far! It’s so pretty, I would love to make this. I love, love, love rag quilts AND puff quilts. This is awesome!! How cute this is and thanks for the chance to win a pattern – my fingers are crossed!! Love it!! I actually working on and finishing a puff quilt right now with fabric from that collection!! I just might have to make one of these now!! So cute! Would be great for my first bigger quilting project. Thanks for the giveaway! What an adorable quilt! I love your original design and this is a great variation! I would love to have this pattern! I purchased your puff pattern when it first came out but haven’t attempted it yet. This looks more my speed. I Love making rag quilts. I’ve made four in the last few months. Can’t wait to try out this version. I love reading about your life and your area. Thanks for sharing both! As much as I love you puff quilts I should really have just bought a pattern by now. Great idea! I love the original puff quilt so this would be a welcome addition! great job Heidi – – super cute, as always!! I love it! I have your original puff quilt and will be making one this summer, once i get a break from nursing school and would so love this more rugged looking puff quilt too! I love it! Nice job!! I still need to finish my first, regular puff quilt, but this would be so perfect for my daughter and maybe her someday sibling too!! Would love to win a free pattern! I LOVE it! Super cute. And for some reason I didn’t even know that you sold the original pattern! I will be scooping that one up ASAP! Thank you! Love this. I want one!!!! Very cute!!! I love the fabric you chose and as a new quilted I am more comfortable with doing a rag quilt, so this is perfect! I haven a 2 year old and a baby on the way and want to make one for each, they are so cute! Beautiful job on the quilt!!! I love the one you did with the green fabrics and the binding on the back too… so cute. I love the colors in this one. Great idea to mix puff and rag! I would love to make one for my daughter! These are perfect for a nursery! OH WOW! I love this and think maybe even this busy mom and new quilter might be able to give this one a try. Your talents are appreciated! I would be SO happy to get a pattern! That is so adorable!! I just love it! I loved the original quilt pattern but was always intimidated by it! I would LOVE to win a copy of this pattern! I know sooooo many people expecting and this would be the perfect baby gift! I have always loved the look of your puff quilt! I would love a chance to win a pattern! Congratulations! You must feel so honored! The colors of each of them are just gorgeous too! Thank you! What a great quilt! And I think releasing any kind of pattern is a big deal – congratulations! Love it! Newest and last little girl arriving in 5 weeks. I’d love to make one for her! Oh!!! This one is my favorite! Hope to make one for my first baby coming in 35 weeks! Just learned 2 days ago that I’m pregnant!!!! Hope that I’ll have the chance to win the free pattern!!! Hope I made it!!! Love your tutorials! I love this! I’ve been putting off making my girls bed quilts because I wasn’t sure exactly what I wanted, but I LOVE the rag version of this! Note to self…must learn to sew! Love it! So very cute in that size and colors. I think it would be fabulous as a larger quilt for a guest room too…so welcoming. I love this look! It would look great on my daughters new toddler bed! I have always wanted to make a quilt and this looks so cozy and cuddly for my kids! I would love to give it a try! I would love to make this quilt. I have 3 great nieces or nephews due this year. This would be a wonderful gift from their great aunt. This is simply adorable! I am a crafty person by nature and caught this on pinterest. I have four kiddos ages 8, 5, 4, and 3 who love craftying with mommy. All of my kids are learning how to sew, my 3 year uses a safty sewing machine but it is all the same to her. I was looking for a project that would take awhile that we could all do together. Where can I find this pattern? This is sooooo cute I want to make one! I would LOVE to make one of these for my granddaughter! They are ADORABLE!!!! I love puff quilts. I would love to have the pattern to make one for my full size bed! Thanks! I’m working on making my first puff quilt with you pattern right now and the directions are so well done that I’d love winning another pattern from you. 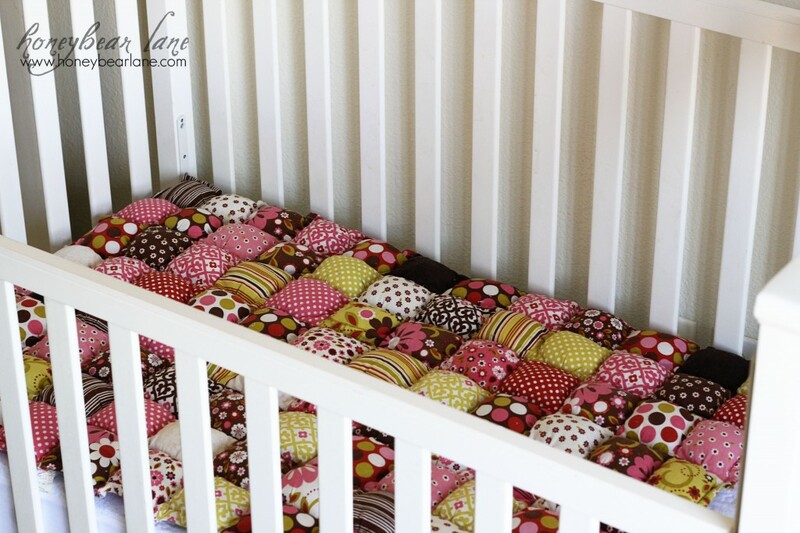 This new quilt is so cute and I love that it fits over a crib mattrice. Hi! I am going to become an Aunt in July. I am so excited!! I have been searching for ideas on a quilt/blanket to make for little Isabella and your Puff Quilt is PERFECT!!! I would love to have the pattern for it!!! i love this idea i was looking to make a rag quilt for my new granddaughter to be born any day. LOVE this! I have been getting into sewing, and this looks like the perfect new project!!! What a great idea. i love making rag quilts and i haven’t seen this idea before. vermont gets pretty cold in the winter and i know a few that would love to use something like this. the kids would love it for the floor too. I am SOOO in love with all of your quilts! You do some amazing work! Love love love the colors you chose for this quilt! It’s beautiful! This is adorable! It would be the perfect quilt for my daughter’s room! Thanks! absolutely adore this one, can feel the warmth just by looking at it images :-). Love this!!! Definitely going on my ‘must-do’ list! I love all of your quilts so much! You do such amzing work! And I must just say I love the colors you chose for this quilt! Its beautiful! Absolutely LOVE your quilt. 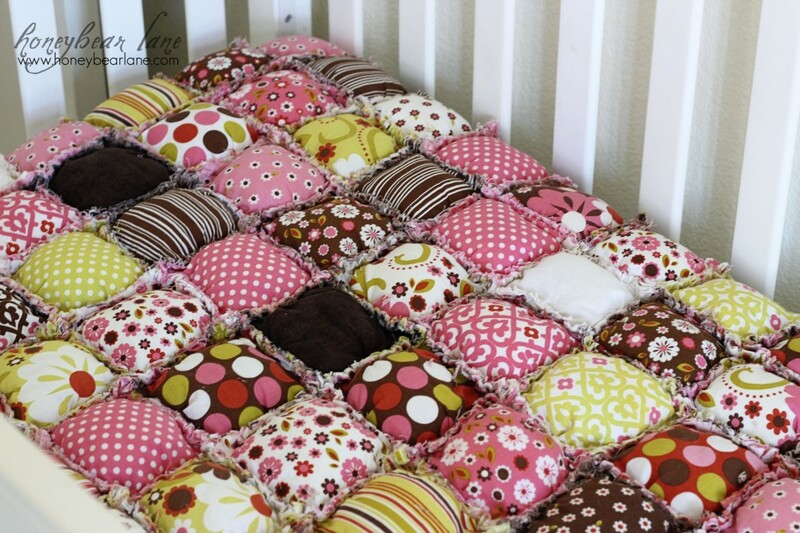 I have always wanted to make one of these for my bed….just looked a tad overwhelming. I think your pattern might be just what i need to take on such a project. Beautiful! Have never wanted to sew a quilt until I saw this. It looks like I could actually make it even as a newbie. I’ve never even attempted to make a quilt but would love a chance to have my first attempt be with your pattern you’re giving away. I love this quilt. I am looking forward to making some. My group is hosting 4 days of kids charity quilts for Children’s Hospital in Denver. I would love to know the pattern to show the gals. Thank you. I love this pattern. Love the fraid edged…they provide so much texture and character. HUGE fan of the puffy quilt. I love this quilt. So cute. I am liking the rag look to it. I just completed my very first quilt ever, a rag quilt. Now I am wishing I would of waited for this pattern, love the puff. Love your choice of material its beautiful blanket! I love this blanket!! I have a bit of an issue with blankets I am told. I have even started making them so the collection is growing fast. I just had a baby girl Jan. 12 and need to start getting some girly ones made for my princess! So adorable! I would love to make for my kids…or our bed…I’ve made rag quilts, but this is just extra cute. this is so cute! has so much more depth to it than a regular quilt. i would love to know how to make one! This would be perfect to make for the upcoming baby gifts I need this summer! Nothing is better than a gift made from the heart, and this quilt would allow something unique to each baby! Love it! Now I know what I’m going to do with the charmpacks I ordered. Thank you! Love the original pattern! I think I need this.one, too! This is the cutest quilt I have ever seen! I am new to quiltingand would love to try this for my daughter or soon to be grand baby. first child just got married & will surprise them w/a quilt of pictures to hang. #2 getting married soon, would love to make something unique for them. don’t sew, never quilted so this is special for me to make/give. mr got me a sewing machine & i’m becoming addicted to my project. would love your pattern b/c same idea (quilt from mom) yet very different & know they’d love it! would love to make it! Absolutely love the pattern and material you used! Thanks for helping me stay creative! I would love love love to try this as my first quilt project…its exactly what i was looking for! Thanks! Very cute! I would like to make one for my bed! Just received an email from my newly wed daughter telling me that she’s gonna NEEEEEED me to make her one of these quilts when they have their first baby. I agree! It’s adorable! this could be my new tradition for our family which i always wanted – i love tradition. my son got married last summer & i believe they are trying to start a family. wouldn’t that be great to give all my grandchildren something so adorable and unique that would be made especially for them. my mom always did that with knitting sweaters, croqueting items & china painted baby sets, etc but i don’t have those talents. this could be all mine alone! I am completely in love with this! I haven’t tried sewing in years, but for this, I just might have to try again! Beautiful! this adorable blanket just went POP off the page to me..Love it and would loe to try and make one. I love the new look! My baby girl will love to snuggle up with this! Cannot wait to get started! I really really want to make this adorable quilt!!! This is adorable. I’m learning how to hand-stitch quilts which I really like but this is so cute. I’ve always been a fan of rag quilts and I’m very excited to try this. The fabrics you picked are so pretty. OMG I LOVE IT! I have the original puff quilt pattern and they’re very fun to make, but this looks soooooo cute! I love it!! I have the original pattern but I love the shabby chic look of this one!! And that fabric collection is one of my all time favorites…I made my daughter an apron knot dress with it!! This is my favorite Puff Quilt yet! It would be so fun to make a couple of these for my nieces! this is amazing! you combined 2 great quilts together and made it one! LOVE IT! I LOVE this blanket and I know many sick kids I would love to make this for! I am a RN and think this is something special I could do for them! I love this! So cute. I’m going to make it for my baby’s nursery this summer. So cute! And I have a few friends that are having babies that I would LOVE to make this for!! I’ve made a rag quilt before (without the puff). Love this quilt! Another thing to add to my to do list. This is absolutely beautiful! I love the rag look and your colors are amazing! This would make the best shower gift for my sister’s adopted little princess! Love, love, love the pattern and colors!! I absolutely love the fabric and that is it faster and easier to make!!! Love this! Would be perfect for my kids bed and maybe even mine!! I don’t think it could get any cuter! Love it! Way too cute! Would love to make this with the scraps I hope to have when I’m finished sewing Baby’s room decor. She’s due to arrive in May. 🙂 So excited! How cool would it be to have a queen size puff quilt!? I might just have to do that! So cute! I can’t wait to make one! I make rag quilts….LOVE the puff/rag combination!!! That is the cutest thing! Love it! This is just what I’ve been waiting for. I am finally geting aroung to painting and decorating my daughter’s room after our move nearly two years ago! I just ordered fabric for the curtains last week and added a little extra to my order hoping to come up with some way to incoporatethe extra fabric into the bedding…now I know how! Cute! I would love the pattern! i love this quilt i love the fact that its rag on one side and finished on the other 🙂 with the 5 babies i know being born this year what a great gift this would be !!! So cute, simple, and do-able! I’m not a quilter, so woo hoo – my kind of quilt! This is super cute!! I love little rag quilts!! I love this quilt! So adorable! I love it! This looks so comfy….i may take the pattern and make it bigger for myself!!! Great job! 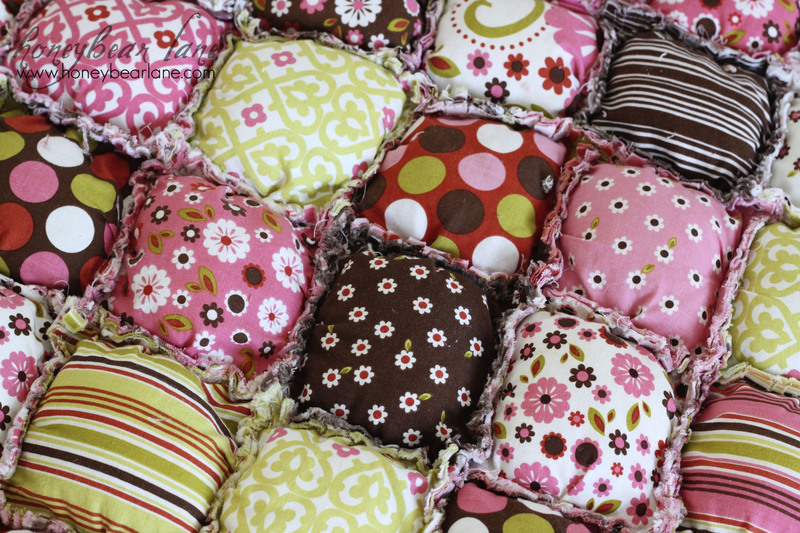 Easy…quick…..great use for fabric bits….my 5 yr old granddaughter would love it…my dog too if larger squares! Terrific idea! Very cute quilt!!! I love rag quilts and so does my baby! This is adorable! Hoping to start a quilt soon 🙂 just had my baby girl 6 days ago! I’ve been wanting to try making a quilt. This looks like it might be a good one to start with. Very creative! You are talented and creative! Thanks for sharing. I have started a regular rag quilt for a baby girl but have yet to finish. Will have another one to make in 9 months! Seriously adorable! Would love to learn how!! I Love This!!!! this would look so cute in my little girls room . I want one… So AdOrAbLe!!! What a beautiful quilt! I would love to make something like this for my mom, who has never had a handmade quilt before! I would love this for my girls’ room! what a perfect combination. Great job~!! oh i love this one! i have the pattern for the other but couldn’t find the time to make it. i would LOVE to make this sweet pattern:) great work!!! Heidi!!! I loved the original buuuuut I love this one even more!!! Please enter me! I LooOoove your quilts! Crossing my fingers to win the new cute pattern!!! I have a new grandchild on the way and this would be perfect for his room! Adorable! I love rag quilts and adding the puff makes it so cute. You’re very creative! I would love to make one of these for my new nephew! LOVE IT!!!! Would love to make one for each of my kids!! I love this pattern! I would love to win! Looks like another winner, Heidi! So dang cute, and I love that Indian Summer fabric pack. Gonna have to get me one. I hope I win! I love the new quilt. It’s really cute and the fabric choices are perfect. I bet my girls would love it if I made one for each of them. Love rag quilts and this one is beautiful!! Thanks for sharing!! I’ve always loved the look of your puff quilts, and this is my favorite! I love this, and think it would be a great introduction to quilting! I’ve always been rather intimidated by quilting, but would love to try this. What a fun quilt – love the colors, and the puffiness makes such a nice quilt. Glad to see you’re doing a pattern. I’ve Pinned the quilt on my Pinterest page so I can see it often – thanks! Would love to have this pattern for my non-profit organization to fundraise for scholarship and this will work when we ladies work together on this quilt project. I so want to make one of your puff quilts. They are wonderful! Oh, I LOVE it! I actually have your original puff quilt pattern, but I haven’t gotten the nerve up to try it because I’ve never quilted before. I’d love to try a simpler version first! Hope I win!!! I how I would love to begin to sew with this beautiful pattern. I am a bit afraid of my sewing machine but desperately want to learn who to do more than sew elastic to elastic. Thank you for offering such a large giveaway- so exciting!!!! Beautiful! I have a rag quilt on my “someday” list. I’d love to make one for my daughter’s toddler bed and my son’s crib. Thanks for sharing the beautiful pictures and offering a give-away. It’s so nice to see a kind gesture when a lot of product prices have increased in our economy. I happened upon your puff quilt one day while perusing through pentrist, and loved it! When I tried to find it again, it was gone. I would really love to be able to try your quilt!!! WOW! I love that! It is so neat how you can have two totally different looks just by flipping it over. This looks so cute, I would love to try it! This is AMAZING!!! Would LOVE to win this!! Oh, wow! This quilt is so adorable! I hope I’m one of the lucky pattern winners! I love the colors of the quilt! So vibrant! I would love to make one. I do love your puff quilts…thank you for the chance to win a pattern!! Love the quilt. Great design!!!!!!!! That new pattern is just beautiful. Awesome fabrics you have used in this one too. I’d LOVE to win this pattern. I have a 2 1/2 week old Granddaughter that I could make this for. Found your site and this amazing quilt via pinterest. I’ve seen puff quilts and rag quilts in other peoples homes and have always loved both but have been too scared to try to make either one myself but I honestly think this pattern would be perfect for my very quilting attempt. Thanks so much for the chance to win this pattern!! I can’t wait to spend some time roaming your site! I love your original puff quilt, but I LOVE this one even more. It’s still got the great details but a little more simplistic, which I like. I would love a patten to make one! I love it! Thanks for the chance to win a pattern! this pattern is beyond cute. I would love to be one of the winners . Very excited to try making this! Love love love this!!! I am new to sewing and I look forward to learning new patterns!! Would love to have this one in my collection!! Just had a baby and have been wanting to make her a fun quilt. This would be perfect! Also, I would like about 6 more hours in the day so I can work on said quilt and take an extra nap too. I’m in LOVE!!! I’d so love to make this quilt for my grandsons!! I love the original puff quilt, I just finished my first one for my nephew. This will be a great new project for neice! Plus i love the shaby sheek look. You are so cute! I can’t believe how much your business has grown since I first met you! You are so talented. I love LOVE the new quilt pattern. I don’t know how to quilt but I would love to attempt this! Congrats on your latest achievements! Keep crafting! P.S. I love your recovered couch! It inspired me to do mine…. I’ll send you a pic if I actually do it! I so badly want to make these! I adore rag quilts and I adore your puff quilts, what could be better than combining the two! Hope you are well! I have made the raggy quilt but absolutely love the puffy look added to it!! Way to cute!!!! I have always wanted to make a puff quilt, and this shabby one is absolutely adorable. Would love to be a winner!! Please count me in for the draw too. I love the new shabby puff quilt (I love all your quilts!). Thank for the giveaway !!! Love all these!! Do you do orders? I love this quilt! I am so excited we are having our first baby and I want to make him a quilt just like this! LOVE LOVE LOVE!! I want one for my KING size bed!! It will drive me crazy to not have the rag version! This is just the quilt I need to make for a friend of mine that is due to deliver a little girl in three months. I know she will love it as much as I do! Thanks for the giveway! I love this quilt! It would be fun to make! Thank you for the chance to win a pattern! Love, love, love this. Please, Please pick me. I am just getting in to quilting. I made a memory quilt for a Sister-in-law. She had a stroke and is in a nursing home, and they let her fall out of bed and she broke her neck in 3 places, she can’t talk from the stroke and they didn’t even find it out for 2 days later. So I made the quilt leaving white squares with red squares (because that was her favorite color). In the white squares people who visit or staff could sign their names. It wasn’t the greatest but it made her smile. By the way after she got out of the hospital they put her into a different nursing home. Yah! This quilt combines two of my favorites! Love the colors! this is so cute! My 23 yr old daughter would love to have this for her bed! This is adorable!! I have been looking for an idea for a blanket for me son. I would like to make on from all his newborn clothes. This would work great for that!! Beautiful & adorable! Cant wait to try this out!! I love the idea that this one is even EASIER than the other one! It’d be fun to win! 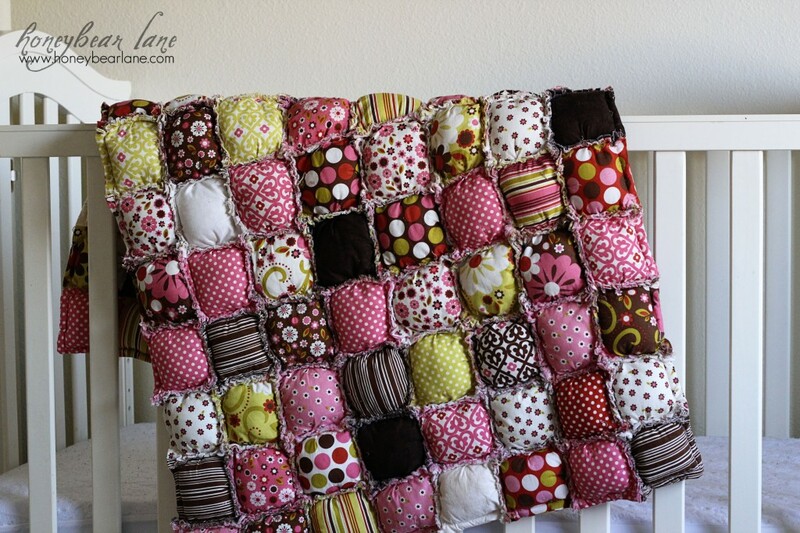 This puff quilt is adorable! I would love to try this one for our new grandbaby! Loving the new pattern! Crossing my fingers praying to win….thanks for sharing all of your creativity! I have received this same Riley Blake fabric line a s a Christmas gift… I’m now inspired to make your quilt 🙂 only missing the pattern !! What an awesomely beautiful quilt! My baby days are long gone, no grandkids, so I’d either make it as a gift to someone I don’t yet know is expecting, or, more likely, make it bigger. Love your choice of fabrics, too. Talented lady, you are. BEAUTIFUL! if I cant win the pattern how can I purchase it? Must have one! I am a beginner at quilting, but love this pattern and would love to try it. I will be a new Grandma for the first time in September. It has taken my daughter 4 years to get pregnant with 2 failed in-vitro procedures. I would LOVE to win this pattern and give it a whirl. I actually made it a New Years resolution to try to make one of your quilts (I have several pregnant friends) – I’d love to try this one!! This is such a darling quilt! Really great look! Would love to win this! Always looking for things for my students to do. I teach high school FACS and woul live to have this for my girls at school! Super cute! I want to learn to quilt so bad. Would this pattern be hard for a beginner? Really cute, but looks a little beyond my skill level . . . terrific job! Wow! I just started quilting. Cant wait to try this one! This is so cute! I just love the look of it. I really want to give the puff quilt a try soon! I would love to learn to make one of these!!! I love it! I need to find more time to sew! Love this version of the rag blanket. I would love to make one myself!! Cool quilt! Combats on your sales. OH my goodness! I would LOVE one of these patterns. I’ve been wanting to make a quilt like this for a while! My son has a small rag blanket but I’m loving the puff version of it! Would love to make this for him! LOVE your blog and your quilts are gorgeous! I am new to sewing and I have been looking for a simple quilt to start out with. This would be perfect! Would love to win this pattern. I would love to make one for each of my children. 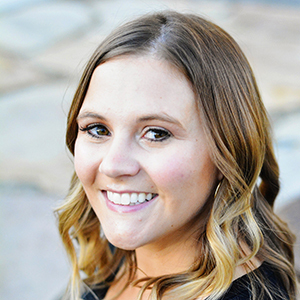 I also am new to blogging and I used your “Bling Your Blog” to add a custom header to my page! I also tried to do the button but my image was too big 🙁 Thanks for the wealth of information! What an adorable quilt & pattern!! Very cute! Makes you want to snuggle up in it and take a nap. I love this quilt!!! I’m not going to lie, I hope I am a chosen one to recieve this free or else I will have to purchase it. 🙂 I was reading your description of no binding (total bonus, I’m not a fan of hand sewing those on) and the other simplicities of making this, I can’t wait!! I’m going to be making a quilt for my husband’s aunt and uncle as a thank you for giving us some things as they downsized their house and this would be perfect since it was mentioned of the simplicity and time to make. So thank you for posting this on pinterest where I found it!!! I can’t wait to check out more of your blog and ideas, you are extremely talented!! This is so adorable…I would love the pattern! I have’t made a quilt in 3 years! This is adorable and has totally motivated me to start quilting again!!! THANKS! Love the quilt! Would love to start making them for my future kids! Saw this on Pinterest and I cont stop thinking about making one. I’ve never made a quilt before but always wanted to. 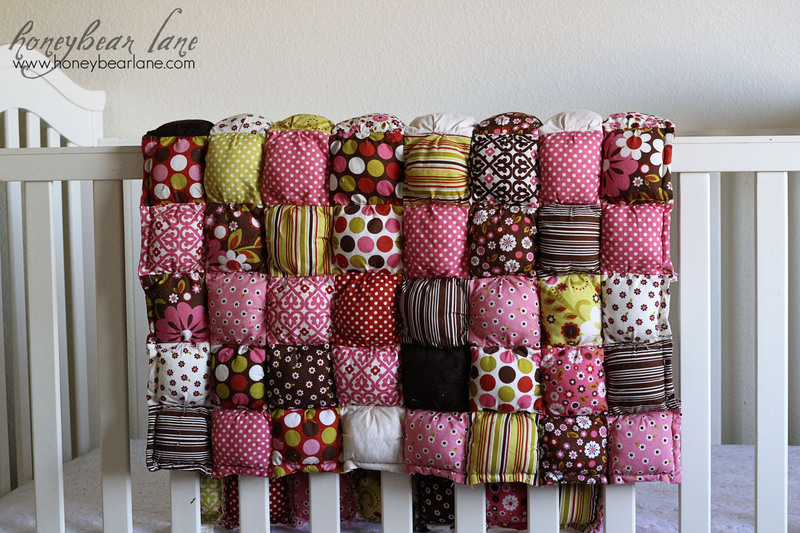 A raggy puff quilt – genius! I love it, it looks so snuggly! This is so so cute and I would love to win this pattern. Thank you for the opportunity! Amazing! I’m not good at sewing at all so an easier pattern sounds amazing! I’d love to try to make a quilt for my daughter. Keep designing and sewing!! You’re amazing!! It’s beautiful. You are so talented. I want to win the new quilt pattern. I would love to win this pattern – I have an array of patterns in blues and greens from my daughter’s toddler clothes I am having a hard time parting with and this would be my inspiration to get going on a keepsake quilt. Absolutely beautiful! This is gorgeous! Would love to make!! I love you quilt!! It is so cute and I love the fabric!! I love this. I’ve been wondering what I can do with scrap material I inherited when my grandmother passed away. I think I could actually do this and have something to remind me of her. Thank you for the giveaway! Very cute! I would love this pattern! I love it. It is absolutely beautiful!! That quilt is so pretty! This is so adorable! Thanks for the giveaway! I love the simplicity of this quilt. I have never made a quilt before but I’ve have been wanting to make one for a friend’s baby. This looks so simple I think it would be a great place to start! I can only imagine how amazing that quilt feels! Love this quilt! I would love to make it for our baby we’re expecting in October! I love this! These would make gifts for my daughters and grandbabies. I can’t wait to make them, and see the beautiful smiles on their faces. I have always loved the rag quilts. I think this is a great new version and I would love to have your pattern so I could make one. I just purchased your original quilt pattern and am in the process of finishing it! I love it SO MUCH! I would love to receive this pattern, since it takes less time and is easier I would love to make this pattern as gifts! I know of a couple of mommies that will be receiving these adorable quilts for their showers! Thanks for another great pattern! It’s perfect! I’m all about easier…and super cute! I love this quilt. I would love to try to make it. I’m going to be a 1st time grandma this summer and treated myself to a new embroidery sewing machine to begin sewing things for my new grandson/granddaughter. The quilt is adorable. I love this quilt! Almost even more than the first one! Would LOVE a free copy of the pattern. Thanks! I LOVE the rag quilts, and puff rag quilts are even better!! Love it!! This is right up this busy working mom’s schedule and my kiddoes would LOVE it!! 🙂 Thanks so much for the opportunity! That’s just adorable! I love that’s it takes less time then the original! I really hope to win one of the patterns! Thanks! I would love to make one for my friend who is preggers! I love this pattern, it would be so nice done in my boys baby cloths that I just can’t get rid of. I LOVE your quilt. I have been wanting to make a quilt and I found the one I want to try and tackle. I love this. I want to do one with my husbands old worn out work shirts. They are all different colors of plaid. I’m so glad you have this pattern! I’ve been looking for something like for a while! Thank you! Love this! I love your puff quilts and I love rag quilts! Two wonderful things in 1! What a unique quilt, it looks so cozy!! You do great work, would love to make one!! I sew but have never made a quilt. The puff rag quilt has inspired me to make my first one. I love it! I want to make it as a lap blanket. OMG.. i had to pin it.. i love rag quilts and i looooove your puff quilts, so this is a winning combo!! Hey, the quilt is perfect. I have a 13 year old daughter who doesn’t often want to hang around with mum. She saw this quilt and asked if we could make it together – joy some hours with Lily just chatting, sewing and doing some bonding. Would love to be able to win the pattern, but if not I will just have to buy it. Greetings from Dee in New Zealand. Oh my goodness! I need this! I got the original puff quilt tutorial and made one for my baby girl (who was born just a few weeks before your adorable girl) but I am not a sewer and it took me a bagillion years to finish it. I didn’t know what I was going to do for my other sweet babies but this is a great solution! Can’t wait to make one for a friend as a shower gift! My cats would never stay off of this! Love, Love, Love this!!! Would be awesome to win this pattern to make one for my daughters new toddler bed!!! Just started sewing and think this might be the perfect first “big” project! Thanks for sharing! So cute! Would love to win a copy of this pattern. I just finished my first rag quilt. Starting on my next one. Thanks for the opportunity to win a copy. I just found your blog tonight and I LOVE the Puff Quilts!! I love to quilt and would love to be able to make a puff quilt like yours. Please please pick me for one of your patterns. I would forever be grateful and warm after I made one. Found this site via Pinterest and LOVE this quilt! I would be eager to try to make a couple. After having 3 grandsons over the past 2 years…I would find much joy creating one for our 4 month old grand daughter and second one due in June! It is just beautiful and fun! Would love this to be made for our baby we are adopting in May! What a beautiful quilt! I dream up my own rag quilts…they are so fun. This is so cute!!! I would LOVE one of these!! I LOVE this pattern. So cute! I can’t wait to make a baby quilt, and maybe even a quilt for my bed! Thanks! My new Great Grandson in Whitehorse, Yukon, would be toasty and warm with a quilt like this. It would be a perfect welcome gift for the newest member of my family. I love it! I’ve been itching to bust out my mom’s old sewing machine and one of my best friend’s is pregnant. This would be perfect! Also, from an aesthetic standpoint, I love the layout of your blog. Nice work. It’s clean and easy to use and looks awesome! You are seriously talented! My husband is building a princess bed for our five year old… This would look amazing in her room! I am not an experienced sewer, but you make it sound easy and fun to do! Thanks for being an inspiration to many! I love this!! I’m definitely new to sewing, but I want to make a quilt so bad– I’d love this for my own bed! I love this!!! It is by far my most favorite quilt! I would so love to have this!! How gorgeous!!! I’d love to win that pattern, it’s soooo stinking cute! This quilt is super cute! I’ve never made a quilt but would love to! This looks awesome! I think I’ll put it on my “to try” list! I love the combination of two of my favorite quilts all smashed together. Awesome can’t wait to try this. This is very cute. Would make a great quilt in a larger size too. I want this to be my first ever quilt! i have two toddler boys that have to share a room, hopefully not forever, and would love to make them each their own lovey blankie ! the cutest quilt i have seen on pinterest! nice work! The perfect quilt and when you are done, you are done, no binding. I love the colors also. That is adorable. My friend of 27 years is wanting her first child. I always make blankets for my friends and family who have babies. I would love to make this for her as she posted it in her interests! It would be a surprise. And if the pattern is expandable to twin size I could make her stepdaughters one as well so they feel part of the newest addition! Super cute. Thank you for sharing. Oh my gosh! This is adorable!!!! I have made a puffy quilt before and it was cute, but this is SO much nicer! I love flannel and I love making tag quilts, I know I would love to make this one!! Wow I think this quilt is funky looking. Would love to make one. It looks like it would be fun to make. That is GORGEOUS! I hope I win! Would love to make this with scraps in a larger size. I LOVE THIS QUILT!!! What a great idea. I have made puff quilts before but you have amazing talent and ideas. I would love to make this! Love love love this pattern! So fun and cute! I have been stressing over crib bedding!! I can’t find anything I like…….until I came across this!!! I am now so excited!! I’ve got to make it!! ABSOLUTELY AMAZING! I WOULD LOVE TO MAKE ONE OF THESE! I HAVE ENJOYED THE ORIGINAL PUFF QUILTS I HAVE DONE AND LOVE THE SHABBY LOOK OF THIS OPTION. I love your blog. You’re a great inspiration to those of us who are trying to keep it all together, and still be crafty. I would love a pattern for your adorable quilt. Genius, by the way, to make it double sided, and therefore much easier to make. It’s truely beautiful! This is so cute! If I got the pattern I would be making one for my new niece or nephew’s baby shower! This is too cute. I see all kinds of possibilities to make this. Thanks for your ability to come up with this unique quilt. LOVE this! I want to make one for my bed. I LOVE LOVE it. I want to make one for my bed. This quilt is beyond cute, it’s adorable. Fashionable and fun! I have to make one now! Not sure if I could handle it with my limited skills but as cute as it is it sure makes me want to try! Adorable! I love your creativity and talent. Thanks for sharing it with us! This looks like such a fun, snuggly quilt! I would love to try one. Thanks so much for the chance! this is soooo cute! i love it. i hope i win! So this is adorable!!! I really want to make this for the little baby girl I’m expecting! I love this! Want to make one in every size! Good job and thanks for sharing! Ive made a rag quilt but this one takes the cake! I’m expecting a baby boy in July and I’d love to make one for the nursery!! Super cute idea! I just love it! Love all your puff quilts! Hurray for a beautiful pattern. Just in time for new twin nephews on their way! Thanks for the chance! That new quilt is soooo cute!!!! Ive been meaning to try to make one of your quilts. This one is super cute! I would LOVE to win this pattern and make a new quilt for my 3-month-old baby boy! Pick me, pick me!!! I have so many baby blankets to make, and these are GORGEOUS!!! Gorgeous. I would love to win a pattern. I would love to win.Have new Grandbaby comming in August would love to make one for new baby!! So many of my friends are pregnant and would love this for a gift! I love your quilts 🙂 I hope I win! I love this! This would be a great project for our shop that would I am sure lead to ordering more to have in stock, could possibly even be a new fun class! Thank you for this opportunity! Super cute. I love the puff quilt and it’s cite with the rag look! Love it! I am hosting a talent show/auction for our missions team at church. We have about 10 youth going on mission trips this summer. I would love to have this pattern to make a quilt for our auction. Thank you! I AM NEW TO QUILTING, BUT LOVE MAKING RAG QUILTS. 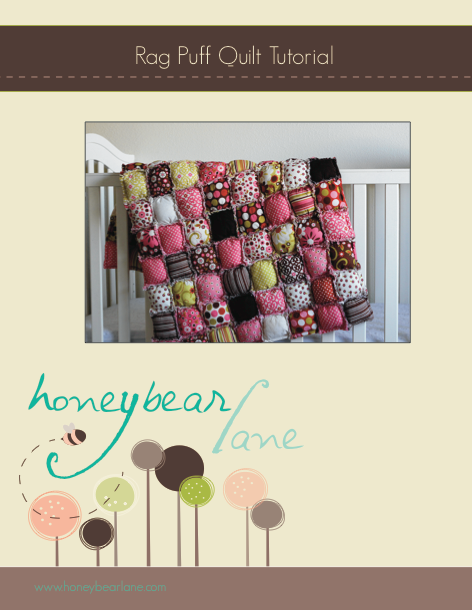 HOPE I WIN A FREE PATTERN TO MAKE YOUR ADORABLE PUFFED QUILT! What in interesting concept…so different! This is adorable and what a cute idea! I know what I’m making for my friend’s baby shower!! I would love to make the quilt for my daughters nursery! I have admired your puff quilt pattern for quite a while now! I have just been afraid to tackle it. This one looks way easier and something I should deffinitely be able to accomplish! You have so much talent, it just amazes me. I’ve just started sewing and I am in love with your puff quilts! They are so adorable and I think they would be adorable in our new twin nursery! oh my gosh! That is the cutest quilt ever! Oh I love this!!! I am in the process of making 2 twin size of your original puff quilts. I have just 60 puffs left to go on the first one and then I’ll be ready to put it all together!! I love this design as well and it would definately be easier. I’ll have to send you a picture of my twin sized ones when I get them both finished (hopefully in a couple of weeks or so). I am a beginner to sewing, but would love to try to make this for my grandbabies! I love your rag puff quilt! Looks like something a child would definitely love to cuddle up with. I’d love to win a pattern! I LOVE this quilt! I am new to sewing and this looks like something I could do. My kids are in need of quilts for their ‘big kid beds’ and this looks perfect for them! Love the new quilt! Would like to make one for my daughter’s bed! Ohhhhh! So beautiful. Finally I have found it! Many years ago I had a puff comforter that I ordered from a mail order catalog. I absolutely loved it and was very sad when it had seen it’s better days. It was the most snuggly comfy thing I have ever known. Now I can make one! I’m so happy:) Thank you! LOVE IT! Never seen anything like it before…and I can’t wait to make it…or I should say add it to my list of projects that I want to make and those UFOs that I’m in process of finishing! Thanks! Love this!! Great colors. I would love to make this for my daughters! I love this new take on and old idea. Thanks for sharing this.